This digital object is not hosted by SAADA. JM: Hello! Today we are doing another one of our oral history project interviews. We have two long term residents of the Greater Houston Area. 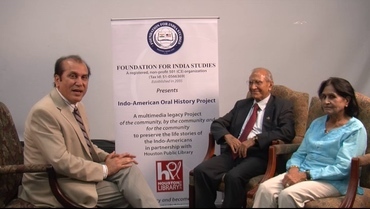 This is of course all part of the Foundation for India Studies Oral History Project and we hope that all of you looking at this years from now will enjoy the recollections of these two wonderful people; Mr. Lachhman Das and Mrs. Lalita Das who have been here for -- how many years have you been here now Mr. Das? LD: We came to Houston in 1974. JM: 1974? Wow! Both of you came together? JM: So what brought you here? MLD: That’s a good question. LD: Well, actually I came as a result of a job transfer; I was working for Pan Am Airlines in New York City and the airline got in trouble, they said that you either leave or we will give you a job in Houston where they had another project. So I transferred to Houston. JM: Now you of course told me about Pan American Airways, which no longer exists. JM: 1989, I see! So you were in New York before you came here? JM: How long were you in New York? LD: I was in New York from 1968 to 1974. JM: And is that what brought you from India? LD: No, I came to this country in 1964 and to go for a higher study, for my master's program in the University of California Berkeley. JM: So that’s almost 50 years ago. JM: Wow! So Mrs. Das did you come at the same time? MLD: No, I came after one year. JM: So you came in 1965? JM: So you went home to get married? LD: No, we were married before I came. JM: I see, I see. So tell me about the old country, where did you come from. JM: Well no, okay it wasn’t Pakistan then? JM: It was India back then. JM: You are saying that -- now this is before the partition? JM: Okay. And then, you are a Punjabi? MLD: I am Punjabi -- pure Punjabi. JM: Both of you are Punjabis? LD: Pure Punjabi but in a different part of Punjab. MLD: Different part of Punjab. JM: It's at the foothills of the Himalayas, right? LD: Well, not I guess so; it is Baluchistan, you know the area that is in trouble these days. JM: Baluchistan, that’s way out south. LD: Yeah, that’s where I come from. LD: I came from -- it was part of India, but it was at that time of course it was all India, there was no Pakistan. But it was West Punjab, see from the river Indus -- on the other side of river Indus there were two districts, one was Multan and one Dera Ghazi Khan. Multan was on this side, Dera Ghazi Khan, Dera Ismail Khan were on the other side of this Indus River. I was born in a small village in Dera Ghazi Khan. JM: Well let me ask you then, so after the partition of India your families migrated to India? JM: Where did you come and settle? LD: No, no, no, I was student you know, I was about 11-years old when the partition took place. LD: Then they took us from the trains and all that from that part of India. Actually the place where I was born there was no trains yet, so I saw railway train for the first time in Multan when they took us on busses from there to the -- and you know when the train showed up everybody said Devi Mata Ki Jay, you know people started to say Kali Devi and that kind of thing. So we were that backward at that time actually. JM: Well, see you have made a big leap, you went from where you didn’t have a train to now you're living in Space City or don’t you live in Clear Lake? JM: How long have you both lived in Clear Lake? LD: Since 1974 we have been there, in fact I have been working for NASA, see with the Pan Am job, Pan America World Airways job that I mentioned to you, they had two kinds of divisions, one was airline division, one was aerospace division. So when the airline got into trouble I moved to the aerospace division. JM: So, as you an engineer Mr. Das? JM: What type of engineer are you? LD: I have Electrical Engineering degree from Punjab University, Chandigarh. LD: Punjab Engineering College in Chandigarh and then from there actually I went to go for higher studies and I wanted to do my master's in Electrical Engineering itself, but then when I got here they didn’t have the kind of engineering that I was looking for and I moved to Industrial Engineering, so I did my master's in Industrial Engineering. JM: I see, from which university? LD: From the University of California, Berkeley. JM: And then to New York? JM: I see! And how about you Ms. Das, how -- you came here in 1965 to California too? LD: Yes, to San Francisco. I was working for -- after my graduation one year after my graduation I actually -- it took me one year to graduate that National Program because I only had a bachelor's degree and she came about -- like I came August of 1964, she came December of 1965 with one of our child, the other child was – no, both of our children were born by that time. JM: I see, okay. So but now you have been in Houston since 1974 and so that’s almost 40 years. JM: You have lived in the Clear Lake area for 40 years? LD: We left San Francisco for about eight-nine months and then came back -- since May of 1975 we have been here continuously. JM: So Ms. Das now, tell me, I understand that didn’t you also have a travel agency? JM: So one of the very well known travel agency is in Houston. MLD: The first one in the Houston area. LD: First Indian travel agency. MLD: Because he said that don’t work outside, start the business. I started the business and the name was Worldwide Travels. And I don’t know nothing about and I hired experienced boys and not the girls coming and giving the immigration this and that -- running almost 20 years. JM: But people don’t know who is Lalita, mostly the companies that they know that Mrs. Das and mostly the Indian, they said that, oh Mr. Das we want a ticket because they don’t know Lalita, because I never introduced myself to the Indians and the -- mostly the companies. JM: So how -- you ran it for 20 years, you said. LD: Actually more than 20 years, 1976 to 1099, 23 years. JM: I see, but were you active also in that Mr. Das? MLD: Yeah, after 5 o'clock. LD: I had a full-time job, so about 3 o'clock or 4 o'clock she came back home for the kids so my job ended at 4 o'clock and I went to the travel agency. JM: I see. But now Worldwide Travel was on which side of town? MLD: Sorry, one was in Clear Lake, one was in Hillcroft. JM: I see, so you would work out of Clear Lake then? LD: Well, basically our head office was at Seabrook, actually that’s in Clear Lake, that’s where we started. But in 1978, two years later we opened our first branch on Hillcroft, 64 Southwest Freeway, there was -- right where that Chevron Station or something. JM: You no longer are in the travel business though? JM: You don’t need more headaches. LD: 1999 we finally -- she finally closed it. MLD: Because as soon as the kids left for the college and finished the college, the older one is a lawyer, the second one is a cardiologist, he is in Dallas and so I said I don’t need it. JM: Yeah, I understand. So tell me, you were also very involved, the both of you, but I know you Mr. Das especially in the Indian community here. As soon as you came here, apparently, you almost jumped into the Indian Cultural Centre. Is that correct? JM: For our viewers, years from now they may not know what the Indian Cultural Centre was; the Indian Cultural Centre is the oldest of our organizations here in the Greater Houston area. It's going to be marking its 40th anniversary this year which is 2013. But, now you started off -- tell me a little bit about your involvement there. Did you have an office, were you an office bearer? JM: So, what led you to dedicate yourself? LD: Cypress C drive and I still remember that, I probably have a copy of my check that I still gave it to him at that time from World Wide Travel actually. JM: So the Indian Cultural Center was really a focus for you to serve your community and to develop a kinship with other people. JM: And you've maintained those all these years. JM: So, now your children were born here, and they grew up in -- they were born in the US and they grew up in the US. LD: No, they were born in India. LD: They were born in not here, they were born in India. JM: They were born in India? LD: Both of them were. JM: I see, okay, okay. Thanks for that correction. But, they were raised here. JM: So, would you consider them Americans? LD: Oh yeah, for sure. MLD: Yeah, because the first one, the older one was three years old, the younger one was nine month old when I came here. MLD: Because I gave them full freedom. No, I mean not -- I gave them full freedom, whatever you like, but do it good. JM: So, now they are -- you are first generation Americans. JM: They are second generation. JM: Your integration into America was that gradual, was that very easy, or did you encounter any problems as you went along in the road of life? MLD: No, because God helped me a lot. He got the job in the Regional Shipping Company. Then, he called me, so I came here. Immediately, I started going to school and I was going 11 o’clock in the night time, coming home about 7 o’clock in the morning, taking care of the kids, and he was taking care in the evening. So that time I took training for the nursing, so I was working almost for three years or two years whatever, so he got the job in the Pan Am. So, he will tell you the whole story. JM: But your integration into America; was that smooth for you? LD: Well, I really didn’t feel any problem. I don't think, people talk about discrimination and all that. Personally, I did not feel. MLD: Even I was going to deliver the ticket to them, but they welcomed me, I had no problem. JM: So you didn’t face any hurdles from people and from the business point of view you didn’t have any option? MLD: Even girls come up and never gave me a hard time. JM: What about you sir did you have any glass ceiling to contend with in your professional life? LD: Not really, not really. I mean there may be something that I did not notice, but I got my fair amount of promotions and whatever and even in Pan Am, I was promoted, they didn’t hold me back or anything because I was an Indian or anything like that. So I really cannot say that I had any ground glass ceiling problem. JM: What about your faith, your religion? Were you able to practice that as you wanted and freely? LD: Yeah, we still do that. JM: You mentioned the Hindu Worship Society which is actually again for our viewers; it is the oldest temple here in the Greater Houston there? LD: Yeah, I was involved in the very first one, even before they moved to World House; even before that we used to be going to 59 -- between York and 59. JM: Right, that's further to the north of I-10 here. JM: But you were -- you found again your kinship with the other people from India and you formed groups that allowed you to flourish. MLD: But, they never gave us a hard time. I never felt that we are something different. JM: So you didn’t feel any discrimination in your practicing your faith, or your culture? MLD: They knew that I am an Indiana, when I delivered the ticket to three big -- some big companies, they always welcomed me. JM: So, you didn’t have a cultural problem assimilating in to America. Did you go often back to India to visit? LD: It's an interesting story that I want to tell you here. JM: Please do, you with Pan Am, probably you got free tickets probably to go to India. LD: I was working when I was in San Francisco, I started working for a shipping company Madison Irrigation, and one of the -- we went to an Indian party, and one of the girls there said I am going to India next week, and she said I am going there every month, every other month or something like that, and she was working for United Airlines. And then she told me why can’t you apply for an airline job? LD: So that is how I applied for about five, five airlines. LD: And Pan Am, I was selected by Pan Am and that's why I left San Francisco to go to New York, people said I am crazy leaving California to go to New York. JM: But, what were you doing when you -- you are an engineer. LD: Yeah, I am still an engineer. JM: With Pan Am, what were you doing? LD: Maintenance Controlled System, it was developing a computerized application of the aircraft maintenance. JM: So, this allowed you to go to India quite often for very little expense? MLD: No, we used to have very good time. LD: I used to joke with people, I would say the reason I went bankrupt is because I travel so much. JM: So tell me your -- you would go to India once a year at least? MLD: No, at that time I was going every other month. MLD: And one day I was going to buy the sweater and one pilot, his friend, he said Lalita, what are you doing here? I said I came for shopping. JM: You were like a true jetsetter. MLD: That was a good time, you know. LD: We used to go to -- airline has a flight to free port, we would sit in the plane, have lunch and then go there and come back same chopper. JM: How about that. That is amazing. So now I guess that's -- when that happened you decided Mrs. Das, you decided to say in the travel business then? MLD: Yes, and I was happy. It was no problem, because every month we had a very good relationship with the Air India people also, and they were coming and I recall for the dinner and this and that, so no, we were lucky, 100%. JM: I see, I see! So now tell me a little bit about your children here, you have two boys I understand. You have already told me a little bit. One is a Cardiologist in Dallas? JM: And then the other one is here? JM: And how many grandkids do you have now? JM: Six? Three and three? LD: Two boys and a girl with the older one and two girls and a boy with the younger one. JM: I see! And are your daughter-in-laws also Indian? JM: They are both American? LD: I mean one of them in the second generation Greek, and the other one is here long time. JM: For a long time. So you now have a truly mixed family, right? JM: Does that create an opportunity for you to teach your grandchildren about India, do you do that often? JM: No, I am talking about your grandchildren. LD: Grandchildren, they, they initially when they were younger, she used to put them in the pooja, like they said Hari Om and all that. They used to do that. But once they grow up, now they don't do that. JM: I see! I see! LD: They are more Americanized I would say now. LD: They understand, they don't understand our language but our kids understand the language, but they don't talk very much. So I think in all, in essence I would say that they pretty much have been merged into the American society. LD: Not that they have broken their complete roots, our kids specially, but grandkids, they are far removed now. JM: Yeah. So your, but this is a normal process, is it not? LD: But not so much, and then they maybe go there when they were born and all that for the curiosity. JM: I see. I see! Do you still have close links with your families in India? JM: So as they pass on, then it becomes less. LD: Her, I think both of her parents died in 1985. MLD: We were very young by then. LD: Since then, our visit to India have been less and less frequent, like every two year or three year. Now last time we went there in 2009. So it is almost four years. JM: I see, I see, I see! So at the same time though, you are still very deeply involved in the Indian community here? JM: How -- what do you do to keep yourself involved with that? JM: Explain to the viewers what India House is. JM: Who is spearheaded and started the foundation. LD: He in fact, in 2000, year 2000, we had a millennium celebration of Indian Independence Day in here in George Brown Convention Center and then after that ICC for some reason after that kind of lost some steam and they pretty much, they were ready to close their shop for some reason that I cannot fully explain at this time. But I can explain it a little bit that they, there were some other organization that started attacking on say ICC. LD: Yeah. So, anyhow, and one of the Board members of ICC, Mr. Harshad Patel, he with Krishna and Prakash, Krishna and I talked a lot about reviving ICC at that time. He said let’s get somebody to take over and Harshad said, who wants to ride a dead horse. LD: Dasgupta, she was President, I was her treasurer. And after that I think my term expired at that time so I was not in the Board at that time, that's why he ordered him to take over me and when he said no, then Bharat Sanghavi, he convinced me to run for the Board. LD: So I – that’s how I got involved. In 2001 I think I got actively involved at the Board. In 2002 I became President. So I was actually President of ICC for two years, that's the only President -- other than Dr. Sindhwani, he was for two years and after that I was for two years. LD: So then, that's when the concept of Air India, I mean of India House was born. LD: I said, one of my first message was we want to have a community center, and we formed an organization called CPAC which was Council for Construction Project for this India House. JM: So India House and ICC have been a great part of your lives? JM: While you were here? LD: Yes, yes. They still are. JM: They still are, yeah. So now what about -- as you have stayed here 50 years now, do you feel like your food, your language, has that suffered in the process or you still -- you feel that you still, you have that, but when your children come for example, do they eat Punjabi food Mrs. Das? MLD: Yeah, most of the time. LD: That's the one thing they love. MLD: Yeah, they love Indian food. MLD: Even my grandchildren, they said that, grandma, why don't you teach me? I said, take a day off, come and I will teach you how to make it. JM: How old are your grandchildren? MLD: He is 22, and he finished four years in the Dartmouth College. MLD: Yeah, we went for the graduation. MLD: And very smart boy. Now he is going to Dallas and give the exam for the residency. JM: I see! So he wants to go to medical school? MLD: Medical, but very smart boy. JM: And what about your language; do you speak Punjabi between the two of you? LD: Between two of us, yes. JM: Even with me you speak Punjabi, that's true. MLD: Mummy was -- I remember that too. JM: Yeah. So now do you -- on the other hand with the children, do they understand Punjabi? LD: Our kids understand Punjabi, they don't speak very well, but they do understand. MLD: If you would say something wrong word against, and they just keep quiet and listen to you and after that they will say, okay, I understand what you said that. MLD: It's a true story. LD: Not say bad things to them. MLD: because they will understand. JM: Would now, do they go to the temple with you? MLD: Up to the high school. JM: -- when they come to visit, do they ever go? LD: We don't go to temple that often. LD: We go mostly on special occasions. LD: But it's 40 miles from, the closest one is the Meenakshi Temple. We go there, but again, the problem there is that of the language. LD: Not only that, they conduct their pooja in very different way, because the North Indian people, we really participate in pooja, there the South Indian people usually the priest does the pooja and everybody. So it's kind of little bit different, but we do go there. LD: And we go there, we enjoy that temple. Otherwise we go to the Hare Krishna Temple and Hindu Society Temple, but special Arya Samaj or, but we never go regularly. JM: So tell me now are you happy that you came to the U.S.? MLD: That's a good question, because he had a very good job. MLD: Then I came here and she said that Lalita you have to wash the dishes. I said, are you crazy? Are you crazy, I haven’t washed the dishes. He said you have to wash the clothes also. MLD: And I was crying. MLD: I say God! I say I like to go back. I spoke to my mother. She said Lalita, now you have to stay there because your husband like there. I said I cannot wash the dishes. MLD: I cannot wash the -- floor and the bathroom, that’s not my business. I was crying almost six months; then know I am so used to -- I love to clean the floor. JM: Yes, so you became very comfortable with America, but the question was do you believe you made the right decision to come here? MLD: Because my kids are here and so my family is my kids and the grandchildren. MLD: So if he will come, the kids are there, then I feel like that we are alone. JM: I see! So what about you Mr. Das? LD: Yeah, Training Visa. And when you work eighteen months, then you say, well, now that you are here you want to at least have your family visit and see what it is like. So then I took some loan for her to come there, then one thing led to the other, and finally in about five years time when I was being promoted back there in absentia to executive engineer position, I got job selected with Pan Am and that was the end of it. LD: I don’t think I feel sorry for what I did. MLD: No, I don’t think so. LD: But as I said the intention originally was not to stay here permanently, but as things developed, I am really not sorry that this happened the way it happened. JM: -- as it's going to unfold? LD: Yeah. Closely on that it was partly his idea and also we got some help from some other people who were closer to the Mayor like Lutfi Ehsan 33.25 and some of those people who had access to the powers to be with, so that they can give us land, have a place to have the statue, Government of India was a contributor, so all that, that’s another project, major project that I think I have a significant contribution to that. JM: Right, but was there something, did somebody for example -- you never suffered any discrimination you said. MLD: Such a nice person, I have no word to say -- any special word. JM: Really? So you have met a lot of the local politicians? MLD: And they respect us. MLD: They remember his name. LD: Whenever we have a function, she shall call me by name, because she remembers me and basically because of my community involvement, my involvement with the politicians was not so much on political level as much as a community cultural level so to speak, so. JM: The statue; and you are talking about the Mahatma Gandhi statue that the government of India donated this? JM: And then it was installed at the Rose Garden in Hermann Park. JM: Which year was that done in? JM: 2003, so 10 years ago. JM: And now isn't there a -- at that statue they have a celebration for Gandhi’s birthday in October? LD: Well, yeah, you see there is a Gandhi Library, and also an Indian Cultural Center as well as Indian Consulate. Usually we have either on Gandhi’s birthday as well as the October 30th, they usually have Prayer Meetings and Gandhi Library is involved in that now, because at that time there was no Gandhi Library but ICC is the one who actually took all the effort, made all the effort to get the statue, brought from there and then again, I have to say Krishna Vavilala had a lot to do many of the details on that project. JM: I see, I see! LD: We developed all kinds of -- have you been to --? LD: There you see all those quotations around and all. JM: So, now after all this time in the Greater Houston area, do you see any difference in the Indian community here, or their relationship to the greater community? The Indian community is much larger I would imagine. LD: Oh, yeah, it is, okay. One other project I want to mention about is the Mahatma Gandhi District. JM: I see, tell us about that. Where is this district? LD: The idea was -- where is it, it's bounded by I think it is Hermann, 59 South and it goes all the way to probably around Fountain I think. JM: I see! Along Hermann Drive. JM: So this is -- technically the little India area. LD: Little India area. Actually what happened that the original idea was to change the name of Hillcroft Street to Mahatma Gandhi Street. LD: And that idea required a lot of work that it was not easy to accomplish because 75% of the merchants had to agree, and you know Little India has not just Indian merchants, they also Pakistani, they have got Iranian, there are other people, different faith, different religions, different areas. So, there was a lot of resistance to naming the street as Mahatma Gandhi Street. So, in that whole process the idea was born that why don't we call the whole area the Mahatma Gandhi District? So, then that's how this eventually the idea of changing the name of street was dropped. JM: But just keeping the district. JM: So, why was this important for the Indian community? LD: Identity and Mahatma Gandhi is a person of peace and all that. JM: No, but it was mostly because there are so many Indian businesses in that area. LD: I don’t think so, yes. JM: That's also the wholesale industry. LD: That's the primary reason. Yes. LD: That's the primary reason. JM: So, this shows the strength and the growth of the Indian community there. JM: And what would you like to see for the Indian community in the future? JM: So, you would like to see more Indians elected into office? JM: And of course there are many who have already been elected. LD: JIF tried it, but he unfortunately did not succeed. LD: Sugar Land yeah, but I don't consider Sugar Land as part of Houston. JM: So why is it that an Indian cannot be elected so far in Houston? LD: Well, again, I didn't say they cannot be elected, but they have not been elected so far. Now the – I mean, I guess the population of Sugar Land -- the reason Sugar Land was a city, Stafford, a vast number of Indians live there, a majority of Indians live in that area. LD: That is probably one of the driver for the people to get elected in that area, Tom Abraham, and then Harish Jajoo, and Ken Mathew and all those people. But there is no such concentration of our people, so to speak, in any part of Houston. JM: But does it take a concentration, do you think that's the limiting factor or is there --? LD: Yeah, I think there is, because most of these people, they have districts okay, and they do the districting, the Blacks have got their own people coming, District 18 or whatever they are, and they are – so that is I think, there you can call it a 41:43 or whatever you want to call it, but it will take a while before Indians really get, not just City of Dartmouth, City Council, but even other states – like state jobs and all that. LD: There is not much. I mean as you can see there is – there is only one Congresswoman Tulsi Gabbard. JM: Yeah, but Tulsi Gabbard of course, she is a Hawaiian. JM: Well, you know we have to wrap up. It has been a pleasure speaking with you and getting to know more about you. I hope that our viewers here years from now are able to look at this video, this conversation that we had, and understand the great variety of experiences your life has had and what you contributed to our community. Our community is richer as a result of the fact that you have dedicated yourself to our community through the India Culture Center, which has been a focus of your life. India House, the Mahatma Gandhi’s Statue that you have mentioned, and of course, you contributed two lovely children and six great-grandchildren, so thank you so much. I think we are going to be able to, future viewers can see this and really appreciate what you have given to them. Thank you sir! MLD: Thank you a lot for giving us the opportunity to speak.